You are here: Home / Self Help / The Rest of Your Life…. 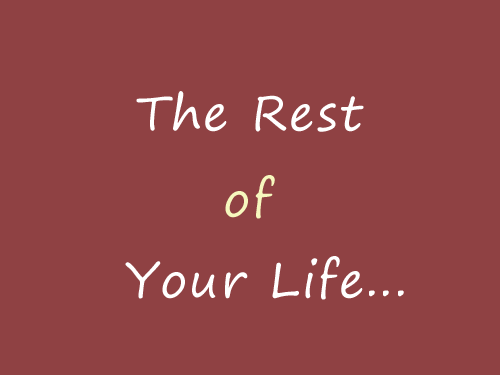 The Rest of Your Life…. I recently read a Paula Deen bio and was, at once, surprised and inspired by what she’s been through. When she was barely into her twenties, she lost both of her beloved parents. Married with two small boys, Paula took in her younger brother, Bubba, to raise as well. The tragedies left her nearly paralyzed and unbelievably overwhelmed by the world that she viewed as cruel and frightening. During this time, she battled agrophobia, which is the fear of being in public. So she went through a phase when she was literally afraid to leave the house. She also endured a divorce around this time. Then, on June 19, 1989, her world changed. She tells the story of how she woke up on this date and began to live the rest of her life. Does that concept move you the way it does me? When I read it, it I could almost feel the words grab me by the arms and lift me up. You know how exciting New Year’s Day is? How it’s all about starting over and having fresh new chances? …take what isn’t working at all and make it work. …take what’s working good and make it great. …come out of our shells. …adopt a little love from a shelter. The list goes on, just as far as the opportunities do. 7 chances are handed to us each week. Here’s a lady who was kicked in the stomach by life and left all but mentally and emotionally paralyzed. She not only pulled herself up, she went on to (along with her sons) start a home-based business with just $200 to her name. This business led to a famously successful restaurant as well as best-selling cookbooks, her own magazine, dvds, a hot line of products, and a wonderful television show on Food TV. I hope with all my heart that whatever you may be facing in life doesn’t compare to what Paula Deen faced down. But, whatever it is…..wherever you are….remember this: Today isn’t just Tuesday, January 10th. Today’s the first day of the rest of your life. Thanks For Commenting on Self Help Daily! Infographic: How Dogs Improve Your Health!